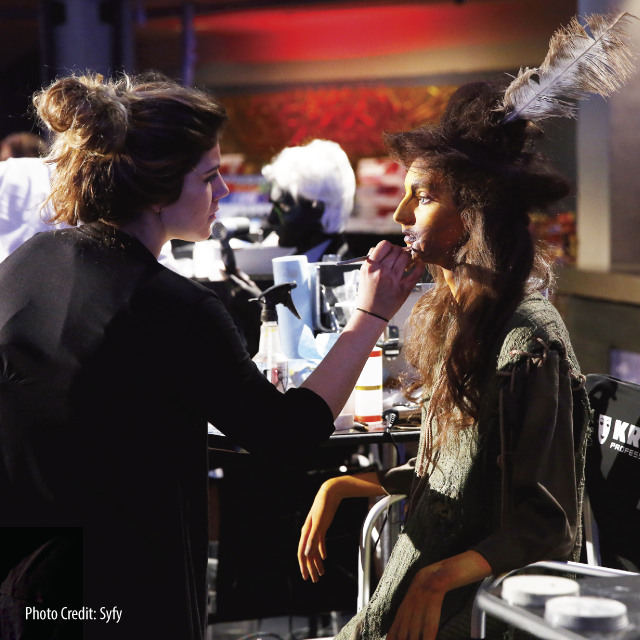 Emily Serpico, a new graduate of Palm Beach State College’s Cosmetology program, will compete in Season 8 of “Face Off,” the Syfy cable network’s hit reality competition series that pits special effects makeup artists against each other in creative battle. The Wellington resident is the youngest contestant in the history of the show; “Face Off” Season 8 premieres Tuesday, Jan. 13 at 9 p.m. on Syfy. On the plane ride to Los Angeles for her “Face Off” audition last June, Serpico couldn’t believe her good fortune, yet at 18 her career path was already years in the making. Her mother, a cosmetologist whom Serpico credits with her success, taught her how to create and style wigs as a little girl. “My love for hair started there,” she says. Then at 14, Serpico chose the G-Star School of the Arts in West Palm Beach for her high school and discovered the art of special effects makeup by volunteering for the school’s annual X-Scream Halloween, one of South Florida’s largest haunted house events. The immediate need was for someone to do scary makeup. “I really wanted to help out, and I said ‘yeah, sure I’ll try it,’” recalls Serpico. She developed and ran the makeup department for X-Scream Halloween for four years until her graduation in 2013. During the Cosmetology program, Serpico turned 18, the youngest age eligible to audition for “Face Off.” A dedicated fan of the show, Serpico says, “I would always find my inspiration on “Face Off” because I would watch every season and be really involved.” She didn’t make the cut on her first audition, but six months later, she tried again and was chosen. Serpico took a leave of absence from Palm Beach State, and everyone supported her, especially Terry Delp, Cosmetology director for the Lake Worth campus. “He helped me through everything.” After the show wrapped, she returned and graduated in December. …and applies special effects makeup. Season 8 of “Face Off” premieres Jan. 13. Waiting for the show to air, Serpico feels in limbo, but has many plans for the future. She’s exploring further education options so she can teach art and will continue her theatrical wig work. Serpico is a card-carrying member of IATSE Local 500—the International Alliance of Theatrical Stage Employees, Moving Picture Technicians, Artists and Allied Crafts. 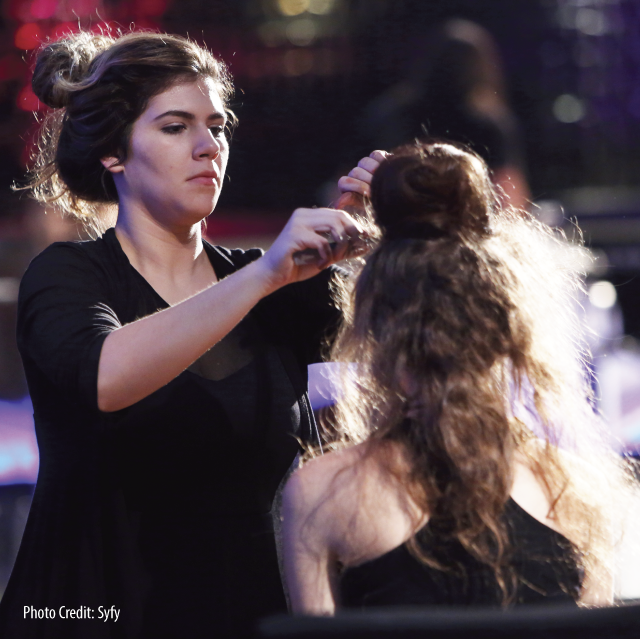 As part of the union’s wigs and makeup department, she’s called to work on theatrical productions, including Broadway shows at local performing arts centers. Follow Emily Serpico on Twitter. Love the show!!! Will be watching and supporting! I love ambitious women like this, keep it up girl!! I will support you all the way!! Emily wishing you much success in your endeavors.